From its traditional home in southern California, this year’s Hollywood Celebrity Shoot moved to the spectacular Desert Lake Country Club located in Boulder City, Nevada, on June 9-11. The change of venue brought a host of new opportunities, not the least of which is the close proximity to Las Vegas. A lot has already been written about Desert Lake Country Club, and it is fast becoming a premier shooting facility in the West. John Laughlin is the man behind the Hollywood Celebrity Shoot. When he took over in 2001, he only had two goals in mind. One was to help the shoot continue to grow, and the other was to raise money for its charity, the Celebrity Youth Sporting Trust. The trust is designed to unite law enforcement agencies with our youth through firearms safety courses, hands-on seminars, and the introduction to all shooting sports. Laughlin’s two passions are acting and shooting. After his years in Hollywood, he knew he could get celebrities to attend, but would shooters attend? With the help of some big-name sponsors, like Caesar’s Palace and Charles Daly Shotguns, what began as a small, one-day shoot has grown into a three-day event with over 500 people attending this year. Under Laughlin’s leadership, the amount of money given to the Celebrity Youth Sporting Trust has grown every year, and its goal is to reach one million dollars through this event and other various fundraisers. For more on this star-studded event, read the full article in the September 2005 issue. Can something that normally takes nearly a year or more be created in one day—without sacrificing quality? Seeing a custom-fitted shotgun stock crafted in less than eight hours is believing. Before you dismiss fiber-optic sights as mere gimmicks, try one atop your shotgun’s muzzle. You just may be surprised, as the author was, that this new technology is no passing fad. Too often we don’t use our long-practiced swing in competition. Why? Because we could miss. So we become careful, our inhibited “parachute”swing costing us targets that we know we can break, but don’t. This eighth annual shoot is more than just an event that allows stars to shine the spotlight on the shooting sports. Its a worthwhile fundraiser for kids’ camps that educate our youth on the importance of firearm safety while introducing them to the fun of shooting. Spectacular scenery framed this competition, where mountainous terrain let target setters strut their stuff to challenge shotgunners. Claythorne Lodge mated this competition with the White Flyer Cup for three exciting days of challenging, championship targets. Great targets and sponsorship continue to make this annual shoot a gem of the Midwest. After an exciting shoot-out at Flint Oak’s five-star shooting facility, Tim Murphy is deemed the new Kansas State sporting clays champion. Scott Robertson won big in the Lone Star State shoot-out, winning the prelim and FITASC events as well as garnering Texas State main-event champ honors. A one-stop sporting directory for everything from apparel to stock work. You will find 20 vendors in our new, easy-to-use resource guide. 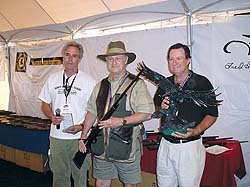 Copyright © 2000, 2001, 2002, 2003, 2004 by Sporting Clays, Ltd. All rights reserved.